This week, Lee sits down with Dwayne Booth. 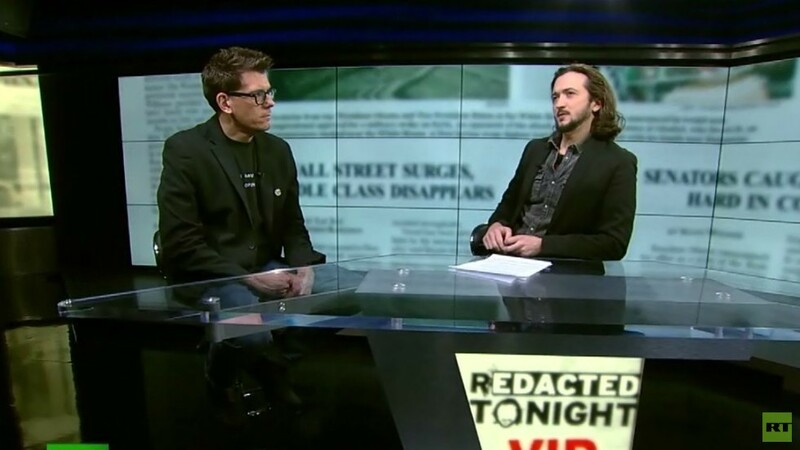 He is a political cartoonist who draws the illustrations that accompany the TruthDig articles of Chris Hedges, host of RT America’s On Contact. Booth and Lee discuss ‘Mr Fish: Cartooning from the Deep End,’ the new documentary about his career. He is known for producing political cartoons with an edgy style. In 2012, some of his cartoons cost him a job with Harper’s Magazine: Online. He skewers politicians and public officials with images that show the grotesque nature of the American war machine, our political system, and our culture. His work has been censored because it conveys uncomfortable truths about powerful and well-loved political figures. He has many drawings that present former president Barack Obama as a war-monger and a fake progressive – many Democrats still refuse to believe or condemn this portrayal of their president. In the second half of the show, Lee looks at a prominent family profiting from the out-of-control opioid crisis that is killing Americans every day. The Sackler family knew that OxyContin could make them a lot of money, so they marketed it relentlessly. They spread lies about the addictive potential of the drug and they encouraged doctors to prescribe it for a wide range of maladies. This marketing campaign has contributed significantly to the epidemic of overdose deaths hitting the US. Since 1999, more than 200,000 Americans have died from opioid-related overdoses.